A series of re-enactments of the history of the geostationary orbit relating to the Bogotå Declaration 1976. One-day replicas of the orbit have been made at Srishti School of Art, Design and Technology, Bengaluru and Invisible Fields exhibition, Arts Santa Mònica, Barcelona. 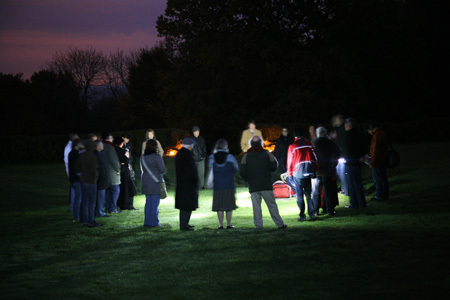 Satellite Stories was a guided walk held one evening in the grounds of Mullard Space Science Lab. It was an event I devised after spending some months visiting Mullard and talking to scientists about the spacecraft they had worked with at the lab and which were now orbiting planets. The project was funded by UCL Beacons of Public Engagement, (the page includes my reflections o the vent) and produced by The Arts Catalyst. Nicola Triscott describes the event on hr blog. spacecraft and studying data spreadsheets. The workshop resulted an extended conversation which was presented in the exhibition along with some of the work produced. There is a review of the show on the Aesthetica journal website. 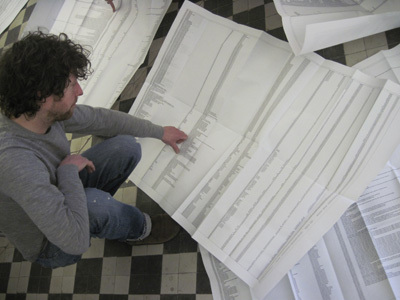 A four day workshop for 25 artists, hackers and writers held at LABoral, Gijon, Spain 10-14 May 2011. The workshop had 3 strands - the poetics of satellites (which I led with MSST and Rene Hofmüller); the construction of satellites led by David Pello and surveillance of satellites led by Alejo Duque. The project spanned several months and involved Madivaala Government School in Bengaluru in collaboration with the Indian Institute of Adtrophysics and the Indian Space Research Organisation. Initially I worked with Deepak Srinivasen and students from Srishti School of Art, Design and Technology Rajasee Ray and Gauri Singh. 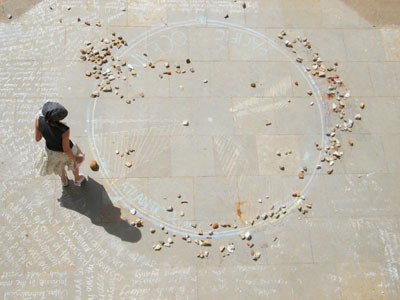 They devised extraordinary workshops in which the pupils drew their space journeys in chalk on the floors. After these I took the children to meet space scientists at IAA and ISRO and their imaginative, exploratory work immediately changed as they absorbed the nationalist and scientific motivations of space technology. Together with Green Chakra Eco-Builders I transformed their work into giant spacecraft lanterns for the astronomy festival Kalpaneya Yatre held at The Planetarium in Nov-Dec 2010. I first performed Satellite Stories at You and Your Work an evening of new work curated by Birgit Binder and Sylvia Rimat held at Cube Microplex in Bristol in 2008. The stories were about the satellites different I had 'met' through scientists during my Fellowship at the Space Science Lab in University of California, Berkeley and residency at the University of British Columbia. GoogleEarth was fairly new when I created a recording studio for visitors to the World Urban Festival to tell stories of early childhood memories using a huge, immersive projection of GoogleEarth. The festival was part of the World Urban Forum. 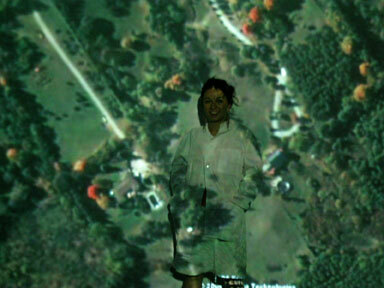 It was extraordinary to listen to memories elicited by the satellite images. I thought there was some connection between the overhead image perspective and the viewpoint we dream from and wrote about it for Leonardo Electronic Almanac. 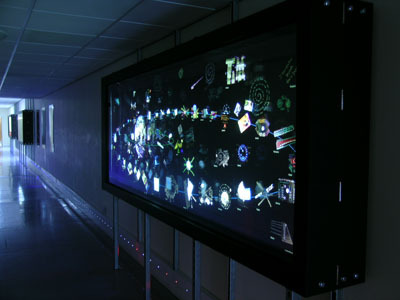 The gallery was a school-wide project that won a Rolls Royce Science Award. 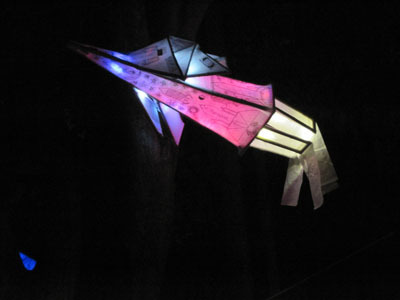 Tony Hall and myself were lead artists and we worked with the Head of Science to develop a number of installations. I created a number of workshops for science classes in which pupils created spacecraft for a lightbox installation I designed called 'Satellites that Monitor my Sense of Time and Space'. 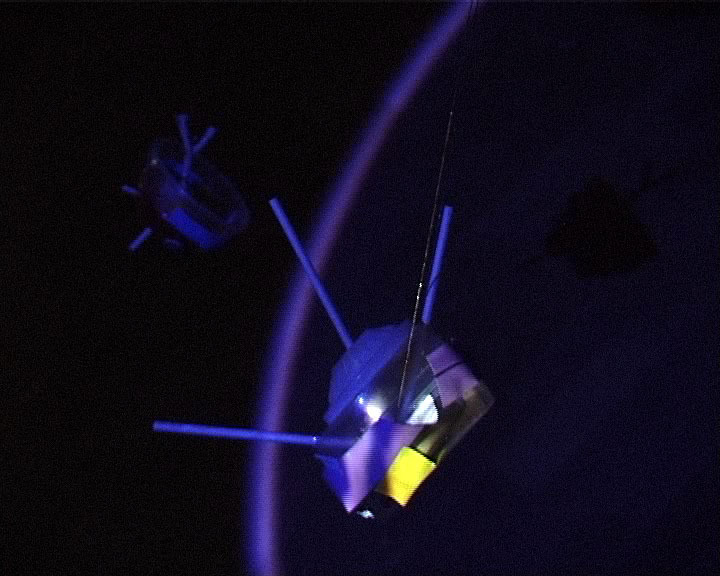 This was a one-day project in which about 100 pupils made spacecraft from junk materials to create a magical orbit around a projected image of a sinning Google Earth. The day was organised by Marion Carroll for The Arts Catalyst at Lambeth Academy in London. 2007 The Luggage Gallery, San Franscisco, USA. (with C.D.Evans). 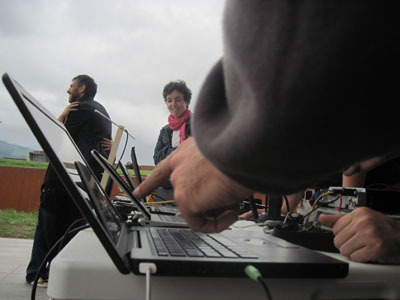 [Improvised soundscape performance using media recorded at the Space Science Lab, UC Berkeley during the launch of the STEREO sun observing satellites. Crash Ensemble Shindig, Dublin, Ireland. Soundscape, 10 mins of interviews with scientists at the Space Science Lab, UC Berkely about lost spacecraft. Citr Radio 109.1FM, University of British Columbia, Vancouver, Canada.